US equities climbed for the third consecutive week. Net weekly gains ranged from 1.3% (Nasdaq Comp'), 1.1% (Trans), to 0.6% (sp'500, NYSE Comp'). 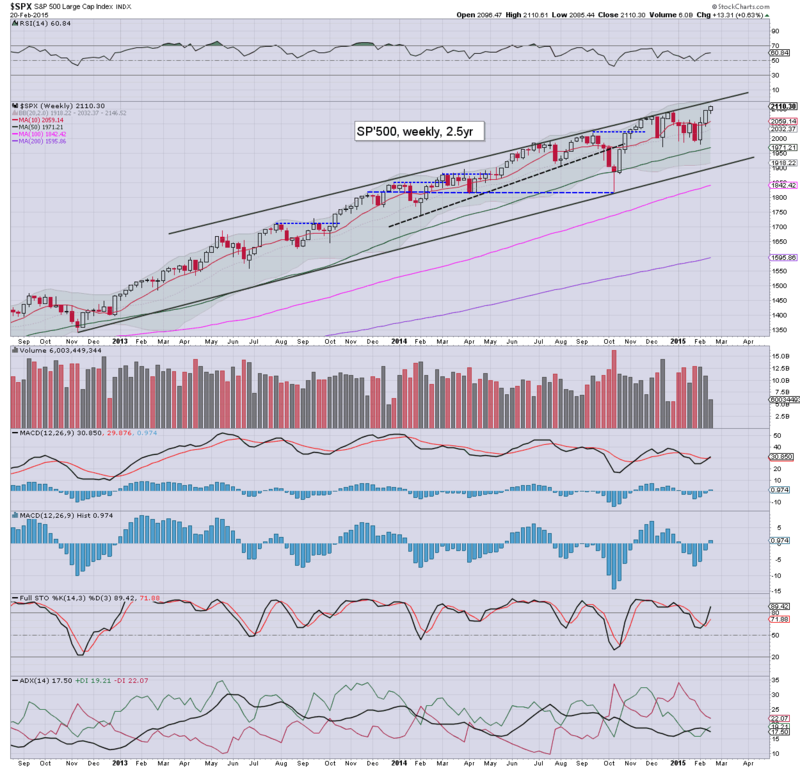 There is notable rising channel/trend resistance in the sp'2110/20s. A minor retrace to the 50dma in the sp'2050/60s by early March will do nothing to the powerfully bullish broader up trend. A moderate gain of 0.6%, but with a new historic high of 2110. Underlying MACD (blue bar histogram) cycle has turned positive, and (in theory) could easily tick higher for another 3-4 weeks. The recent low of 1980 looks set to hold for some considerable time. At best, equity bears have a 'moderate' possibility of a retrace to the 50dma, which will be in the 2055/65 zone in early March. The tech' is leading the way, with the Nasdaq higher by a significant 1.3% this week. Far more notable though, the Nas' is just 45pts shy of the giant 5k threshold. From there, it is a mere 2.6% until the March'2000 bubble high of 5132 is challenged. Any monthly close in the 5200s this spring/summer, will bode for a straight run to 7K... certainly no later than spring 2016. 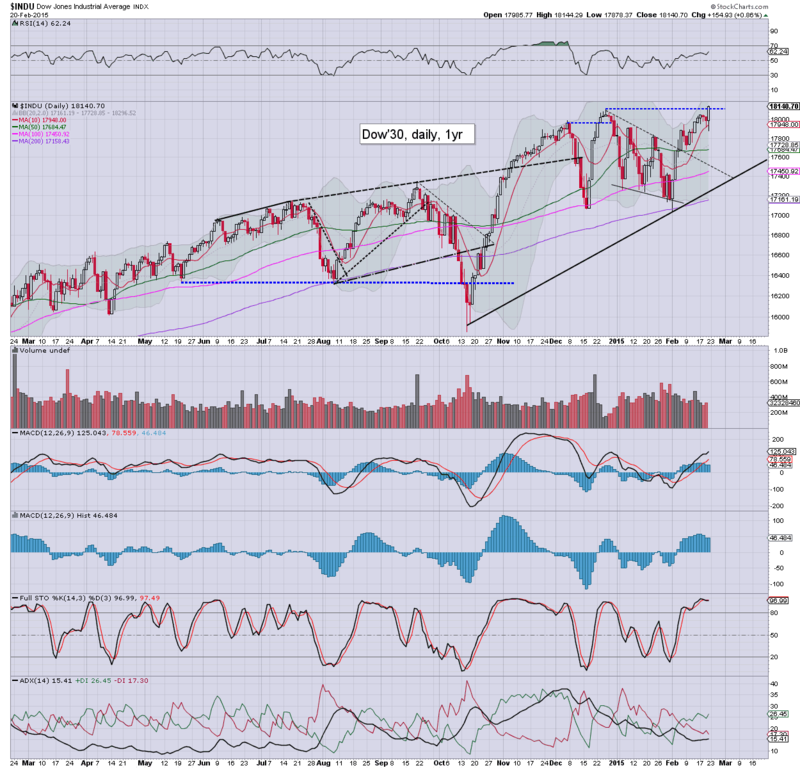 The mighty Dow continues to climb, attaining a new historic high of 18144, with a net weekly gain of 121pts (0.7%). 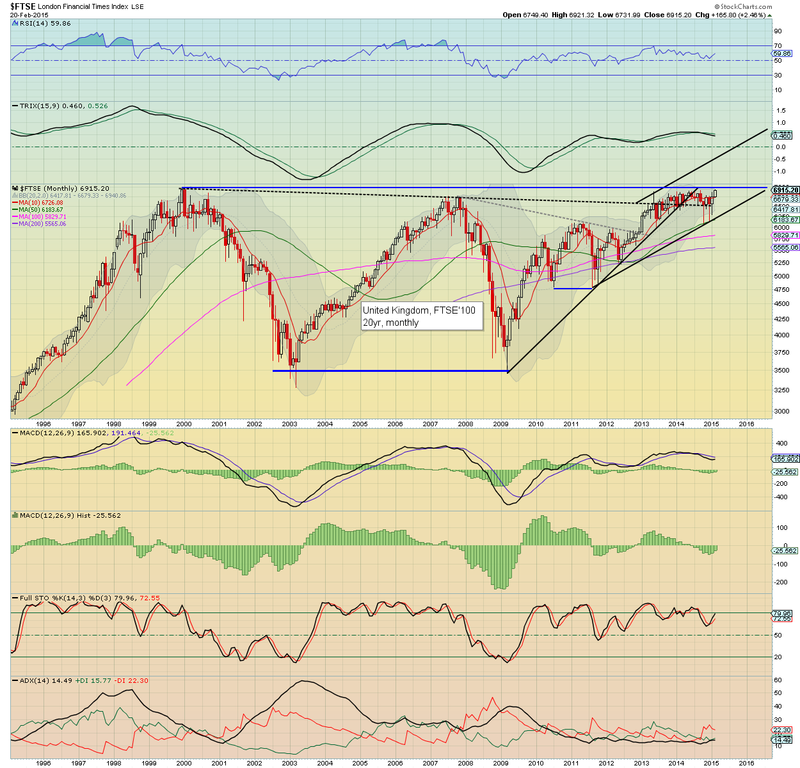 Upper bol' is offering the 18500s in the near term, that is another 2% or so higher. The master index managed a new historic high on Friday of 11111. Upper bol' is offering the 11200s in the immediate term... roughly 1% higher. 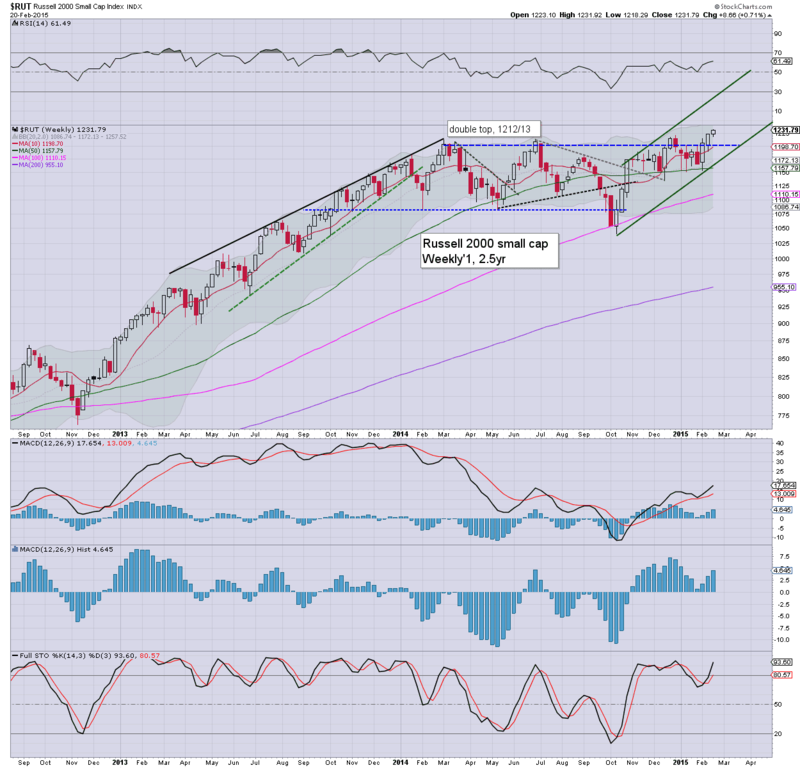 The second market leader is confirming the initial break higher seen in year end... with a move to 1231. Upper bol' is offering the 1250s in the near term. Having been stuck in a rather tight trading range (similar to Transports in 2012)... the R2K has broken up and away. The 1500s look viable this year. 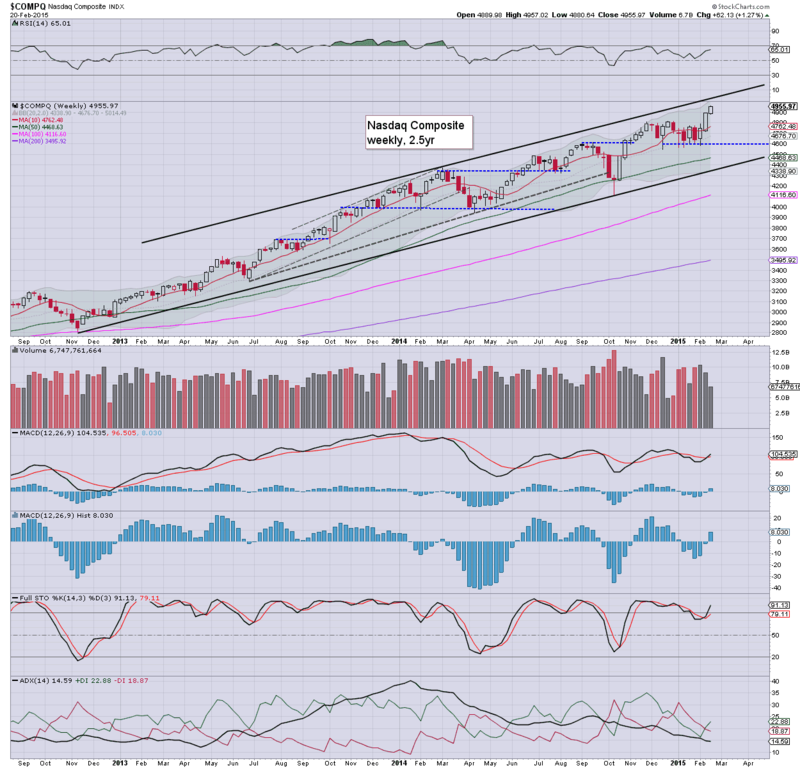 The 'old leader' managed a gain of 1.1%, with a weekly close in the 9100s... pretty close to the late Nov' high of 9310. The giant 10k threshold looks due. Without question, the US equity market is holding a 100% bullish stance. We have new historic highs in a number of indexes, with the Nasdaq Comp' set to break the bubble highs of March 2000 within the next few months. A late spring/summer correction is no doubt going to happen (The Greek issue will rise up again in May/June), but it will probably be from levels much higher than are currently traded at. With the ECB QE-pomo train set to arrive in the EU in March (and scheduled to stay until at least Sept' 2016), any pull backs will likely be minor and brief. I've been particularly highlighting the UK market recently, and we're about to the see the giant 7k threshold achieved... breaking the historic high of Dec'1999. A monthly close in the 7000s will be a powerfully bullish signal. For the equity 'doomer bears' out there, when you have markets like the FTSE about to achieve a multi-decade breakout, it sure isn't bearish... is it? Next week will be pretty busy... and will centre around the Yellen. F - GDP (first rev), Chicago PMI, consumer sent, pending home sales, *there are no less than 3 fed officials at a 'monetary policy forum' in NYC. I would have to guess that we'll see the market attempt to begin a minor 1-2 week retrace starting next Tue/Wed. At best though, sp'2060/50s... where the 50dma will be lurking. On any basis though... with the 'Greek situation' seemingly kicked out for another four months, there is no reason why the broader upward trend won't continue into April/early May. By then... we'll probably be trading somewhere in the sp'2250/350 zone. 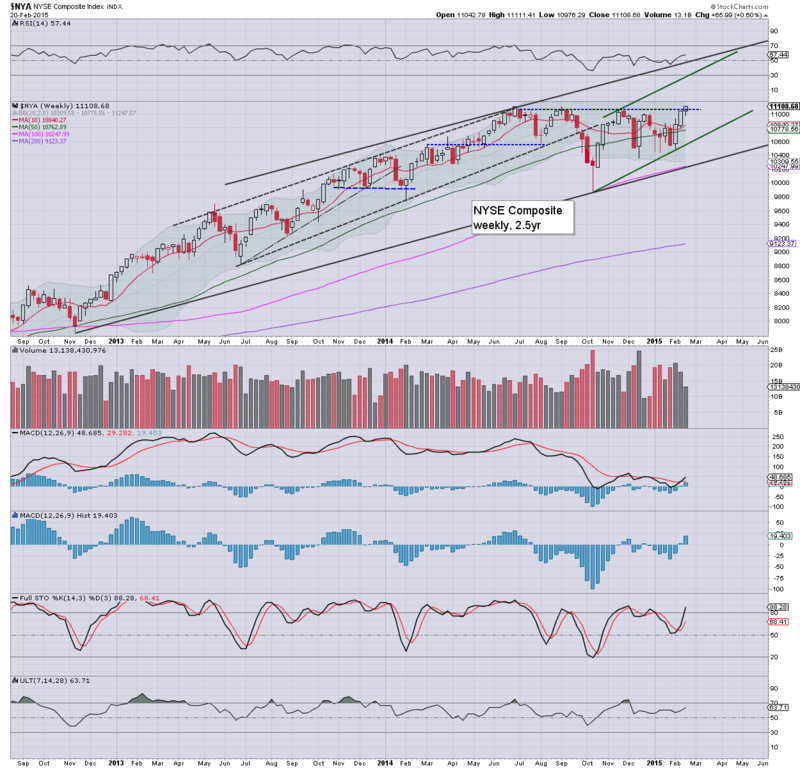 US equity indexes saw net weekly gains for the third consecutive week, with the sp'500 +13pts (0.6%) @ 2110. 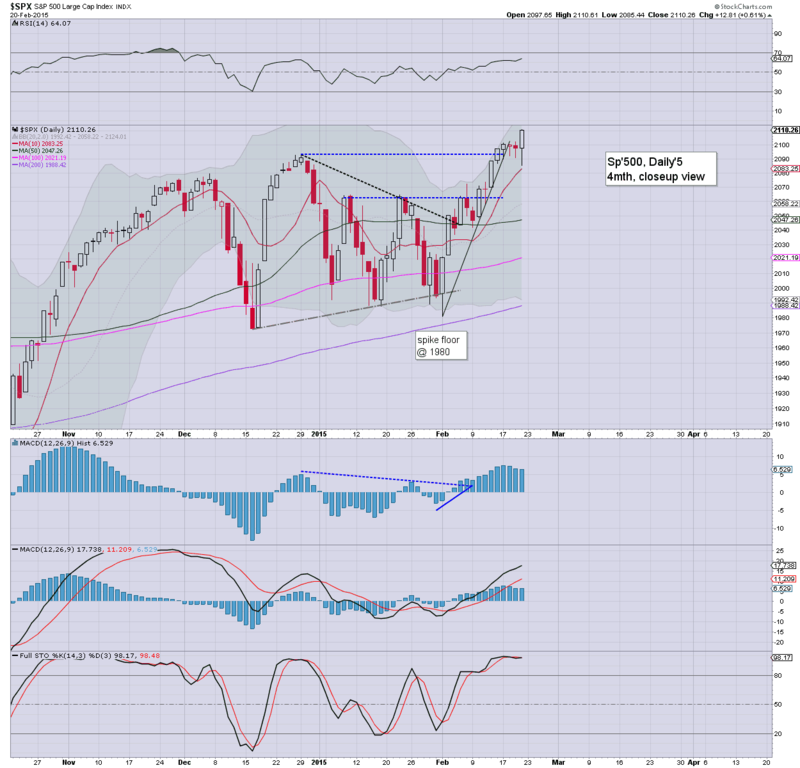 There is weekly trend resistance in the 2110/20s, but the broader up trend looks set to continue into the spring. No doubt though.. a basket of crash calling doomers will start to now appear. 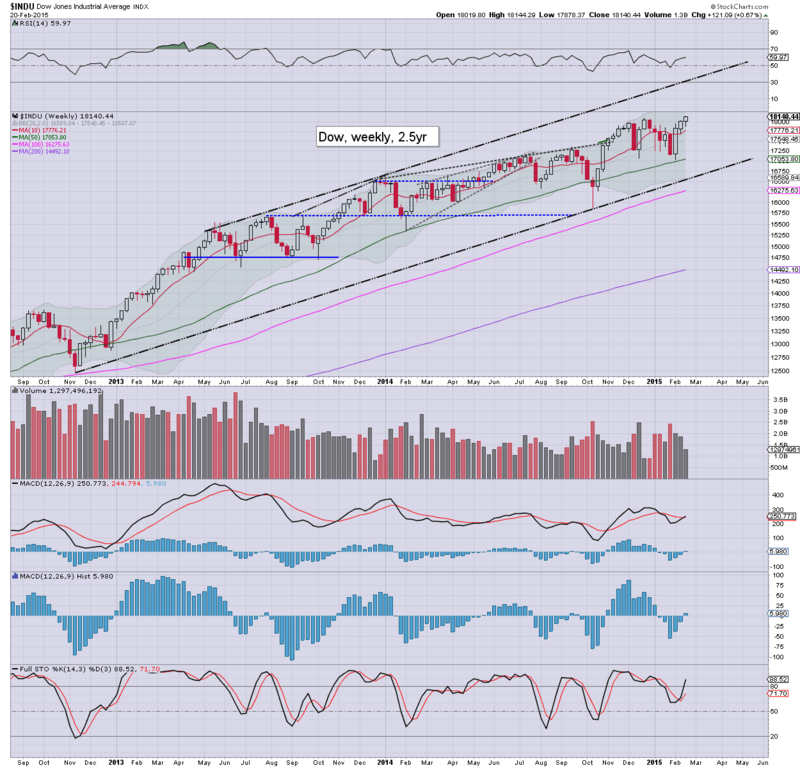 Clearly, there is trend resistance - seen on many indexes, in the near term. 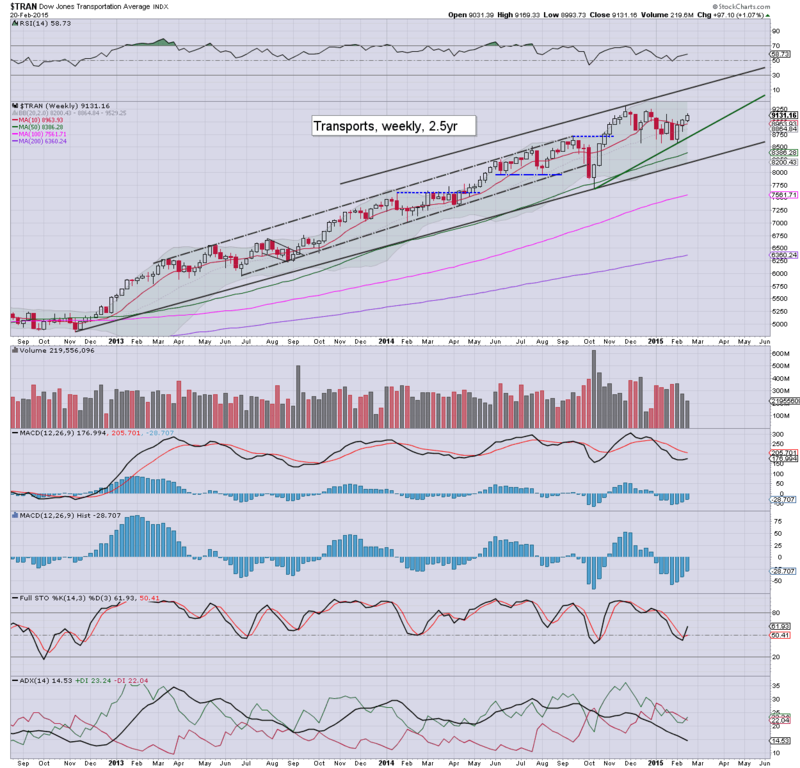 Yet, as I noted in my New Years day post... one aspect to look for this year will be an acceleration of trend. Perhaps we are about to see that... not least as the QE-pomo train is set to arrive in the EU. It has been a tedious week... I gladly welcome the weekend. US equities melted higher into the weekend, sp +12pts @ 2110. The two leaders - Trans/R2K, settled higher by 0.6% and 0.3% respectively. The bigger weekly cycles will be offering stiff resistance in the sp'2110/20s, but at best.. any retrace is likely to not go much below sp'2050. 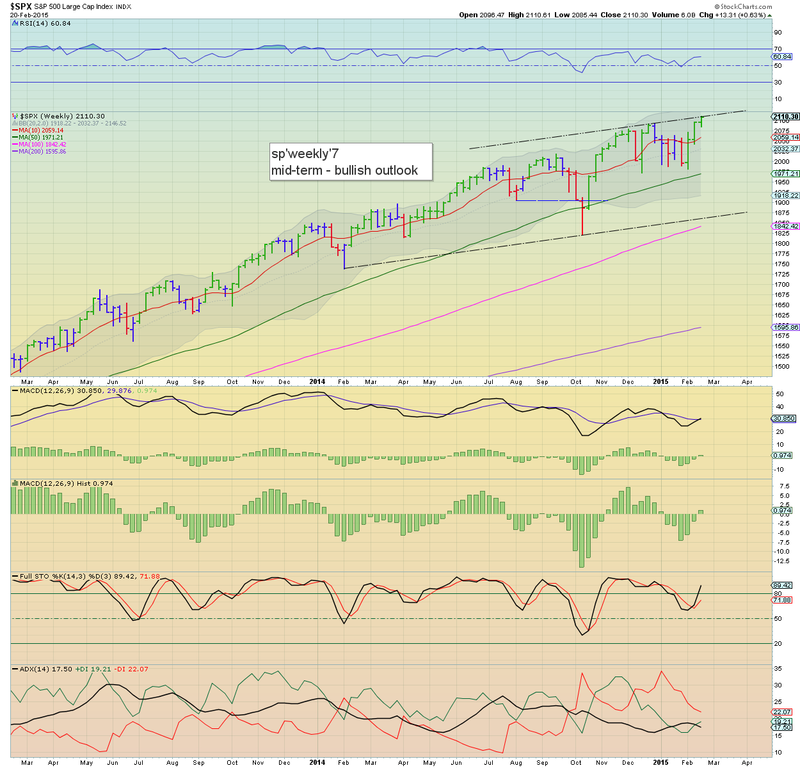 Suffice to say... new index highs in the sp'500, Dow, R2K, with a post 2009 high for the Nasdaq Comp'. There is simply nothing bearish... although we're clearly due a retrace... if only to the 50dma in early March.. somewhere in the sp'2050s.